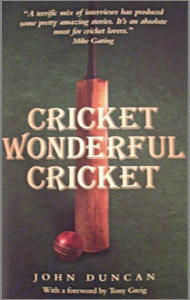 When I contacted Liz Mallett at John Blake Publishing for a review copy of another book, she kindly included John Duncan’s Cricket Wonderful Cricket also and it was after reading that all proceeds would be given to the cricketing charity, The Lord’s Taverners, that I realised that I had met John when he was commentating and I scoring at one of The Lord’s Taverners events at the impressive residence of Sir Victor Blank, one of the interviewees in this very enjoyable book. John Duncan’s idea of interviewing well-known people who made their names in other careers but who have long been associated with cricket and have a deep-seated love of the game came from a book which he had enjoyed following a similar pattern: Gyles Brandreth’s Brief Encounters. John’s stipulation was that none of the interviewed had played First-Class cricket. There are twenty selections and four came reasonably close to not fulfilling this criteria. Having myself compiled the career records for The Lord’s Taverners, I am interested to find that at least ten have represented The Lord’s Taverners from the scorecards which I worked from. The interviewed people encompass, amongst others, a prime minister ( Sir John Major), royalty ( The Duke of Edinburgh: The Lord’s Taverners Patron and Twelfth Man since their inception in 1950), a football manager and player ( Graham Taylor), thespians ( John Alderton, Lorraine Chase), a cook (Ainsley Harriott), those from the musical world (Sir Tim Rice, Bill Wyman), the recent President of The Lord’s Taverners and quiz show host, Chris Tarrant, and the current President, Barry Norman, as well as an impersonator, Rory Bremner. All the interviewed recount their experiences of cricket: their views, their performances and, above all, their love of the game. David English also runs his own charitable side, the Bunburys, and it is wonderful that all those mentioned in Cricket Wonderful Cricket and many others that they give so freely of their time in such worthy causes. It can also be a splendid way for spectators to meet such big names. John Duncan starts off with a brief resume of how each person made their name and, at the end, there is a glossary of some 200 people who the interviewed mentioned. Some will be well-known, others possibly not. John Duncan himself has had an interesting life with a successful business career behind him as well as being a writer and commentator. He still commentates at Taverners matches and was a former cricket manager for the same charity. Nicely laid out with some interesting photographs, this is a very enjoyable book and excellent value for money.